‘Say it is avocado if want to be popular’. Avocado is a high demand, high value tropical fruit recognised for its nutritional value. In fact, it has all main food elements, many vitamins, minerals and good fat. But, the potential of avocado to be a perfect nutrition supplement is restricted by its price. Why are they so expensive? It relates to short supply for high demand, being a seasonal crop. More and more orchards are essential to serve the exponential demand around the globe and the limitations narrow down to slow plant propagation. Avocado is a grafted tree. Propagation of avocado refers to the propagation of a rootstock cultivar, which is then grafted with budwood from a mature scion cultivar which eventually bears the edible fruit. Elite rootstock propagation is critical to maintain the quality of fruit and farm management practices. It’s not an easy task to root an avocado cutting using a simple rooting procedure. The disadvantage of using avocado seedlings as rootstocks is that it results in unpredictable orchard performance as every single seed is genetically different even those from the same tree. Rooting of a cutting involves grafting (to a nurse seedling), a dark incubation period and a rooting period. This complex, lengthy and expensive process is well reflected in the availability and price of a plant. In Australia, farmers wait for plants for more than 2 years. This creates limitations on rapid industry expansion not only in Australia but around the globe. Over the last 5 decades the industry has sought alternative propagation methods for rootstock propagation. The potential of micropropagation has been well demonstrated for a wide variety of economically important plants. But avocado is highly recalcitrant to tissue culture conditions. My PhD aimed to develop a micropropagation pipeline for avocado. With numerous optimisations, I was successful in establishing the world’s first high throughput micropropagation pipeline for avocado using shoot tip culture. The method developed can produce about 500 plants from a single shoot tip within 10 months, compared to a single plant produced from one shoot by the current industry practice. Moreover, this technology requires no nurse seedling, grafting, etiolation period and it is independent from the growing season for propagation. 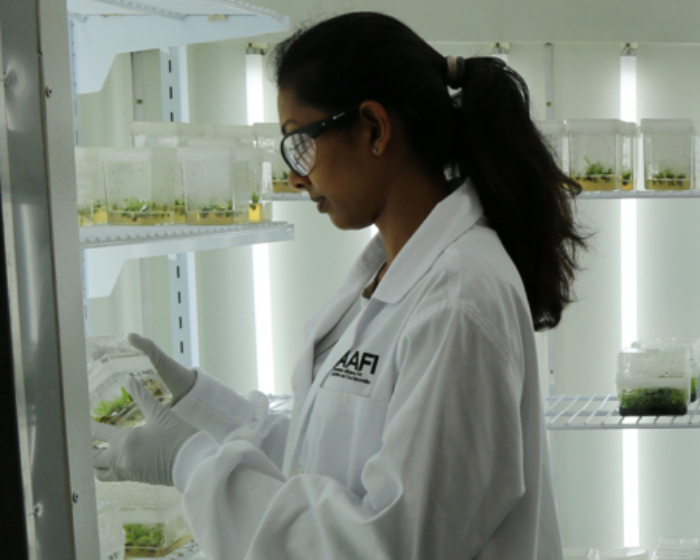 Further, the plants produced under sterile conditions are pest and disease free, ensuring they meet export requirements. The technology developed in my project has a great potential for both the Australian and global avocado industry by meeting the timely supply of the high demand for clonal avocado plants. Further, as the avocado is a very nutritional fruit it has the potential to be a very important nutrient supplement if it can be produced at a more affordable price. The underlying techniques are also applicable to other recalcitrant woody plant species for micropropagation, providing a platform to work with other economically important plants to make a huge impact on the horticulture industry across the globe. Having grown up in Sri Lanka, a country with an agriculture-based economy, my PhD is all I wanted to do as a young scientist. It is titled, ‘Application of plant biotechnology to improve agriculture to ensure future food security in a global context’.